Я занимаюсь литературным творчеством, пишу художественные романы, повести, рассказы, новеллы, стихи, киносценарии, драматургическе произведения для театров, пишу с шестого класса, первый серьезный опыт, вошедшие в мои сборники – это рассказ о любви юноши к женщине бальзаковского возраста, я нписал его в 21 год. Мои рассказы написаны в основном до 24 лет. Свой первый роман написал в 25 лет – “Бабочка – Павлиний Глаз”. Мои книжные учителя: Лев Толстой, Федор Достоевский, Рене Декарт, Блез Паскаль, Фридрих Ницше, Ф.С.Фицджеральд, Э.Хемингуэй, Джеймс Джойс. Марсель Пруст, Сомерсэт Моэм, Дж.Д.Сэлинджер, Габриэль Маркес, Э.Л.Доктороу, Томас Пинчон, Джеймс Керуак, Альбер Камю, Жан-Поль Сартр, Мартин Хайдеггер, Жан Бодрийар, Ортега-и-Гассет, Бунин, Юрий Казаков, Хорхе Луис Борхес, Ален Роб-Грийе, Элиас Канетти. По образованию я – преподаватель философии, кинодраматург, журналист. Я пишу на двух языках: казахском и русском. together like the Pleiades,1 appeared in front of us. hair wrapped in a high bun. creature, I feel as though I’m falling in love for the very first time. her with my eyes. She pulled open the door and stepped inside. She disappeared in a hurry, not even looking at us. the door shut. I didn’t like that; she had impressed me greatly. Aqterek was on the eastern side of the Qarqaraly Mountains. by dense forest. With its steep canyons and high cliffs, I could. – Pleiades: a constellation of seven stars, widely revered in the region and featuring in many legends. see the resemblance between Zhetiqaraqshy and the poems of Qasym.2 Everyone knew my preference. But my brother-in law would reply with a substantial argument. He would compare Shankoz to a flash of lightning. When we entered the house, the forester’s daughter was drinking tea. She invited us to join her. My brother-in law said that we were in a hurry. She told us that we would find her father next to the GAZ-53.3 Three apples were lying on the table. One of them had a small bite out of it. The track headed off towards Zhirensaqal Peak. Breaking pine twigs as we went, a tray-like, shallow road led us to destinations unknown. On our way, we sheared off the overhanging branches of trees with the board-edges of the truck bed as we drove past. Sometimes a group of thick-calved birches protruded from the rest. When the hole-filled road zigzagged, the wheels slipped and the GAZ-53 changed speed. One moment it slowed down, the next it sped up. Meandering through the forest, the three of us became as close as relatives. I thought how nice it was when people sat in a cabin together and tried to help each other. We came to a clearing with cleanly stacked logs in the middle. We were soaked with sweat before we finished loading up the logs. It was hot that day. The heat made us thirsty. We dragged the big logs to the track, which wasn’t hard to do. It was agonizing, though, to load them onto the truck. On the way back, we were relieved to be done with it. The forester and my brother-in law started telling stories. We reached the village before dark. We drove down the hill and spotted the forester’s large house first. When we went inside, his daughter was setting the table. I noticed the apples again. Only one of them was half-eaten. We stayed for quite some time at the forester’s house, singing the praises of Qarqaraly’s forests. 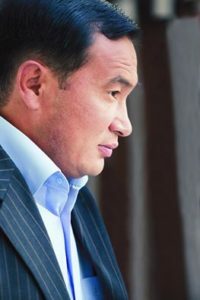 – Qasym Amanzhol: twentieth-century Kazakh poet, known for his sharp tongue. – GAZ-53: a truck model widely used throughout the Soviet Union for agricultural purposes. His wife brought out a samovar and served tea with milk. I started sweating. We relaxed, drinking tea, taking our time. We lay down on soft cushions. The host took down the dombra that was hanging on the wall, adjusted its bridge, and turned its tuning pegs until it was in tune. He rested his head on a pillow, lay on his back, and played three famous küi 4 by the great Tattimbet: Kökeitesti, Sarzhailau, and Bestöre. The forester walked us out himself. When the car moved, his daughter came out with a bucket and smiled faintly, looking at us. I replied with a smile. We didn’t stop along the way and made good time, getting home fast. The GAZ-53 stopped right at the gates. I jumped out of the car and opened the gates. We put the car in the yard and decided to unload the logs in the morning. We were exhausted.